US President Barack Obama has set two dates: visit an asteroid by 2025 and visit Mars by mid-2030s. Some problems in space flight were not anticipated. This opens up the need for further research beyond microgravity. When commercial ferry Dragon docks with the Space Station it will herald a new era of space exploration. For the first time commercial companies will enter the equation on their own accord. Cygnus is an example of an international commercial endeavour. Space Station international partnership is perhaps its greatest strength. From advancing individual countries to advancing as a whole. Q: Is NASA heading towards increasing risks to achieve the incredible goals set? A: We are definitely not lowering the requirements or increasing risks. Extensive testing will be conducted on the Orion spacecraft. Of course space exploration is inherently risky, that is why many of us are here. Q: What are your views on the academic research versus commercial research on ISS? A: If we truly want to enhance utilisation we need to cast our net as wide as we can. Q: How do you see international cooperation in achieving NASA’s goals? A: Previous Apollo mentions were basically all American. Today we are all on the same goal. International cooperation is assured. We cannot do what we want to do without you. Q: Is there a precursor mission to all these flights planned? A: Because of our budget constraints we need to look at reshaping our missions to meet all priorities. You will start to see, this summer, a realistic programme with smaller missions that still achieve the goals set out. Curiosity will land on Mars in August. It will be the largest spacecraft to land on Mars. Many countries have a skill in space flight. American space flight is skilled in landing operations. Q: Will partnerships enlarge ISS collaboration? A: The partnership we have was hard to achieve. We decided not to change the treaty as it would take a long time. Instead we decided to offer partnerships on a different basis. Q: What will the role of partnerships in the next space station? A: The ISS cannot be the only destination in low Earth orbit. Private companies need to create new destinations and platforms in orbit. Free-flying platforms that offer space for experiments to run over long periods of time is the future. 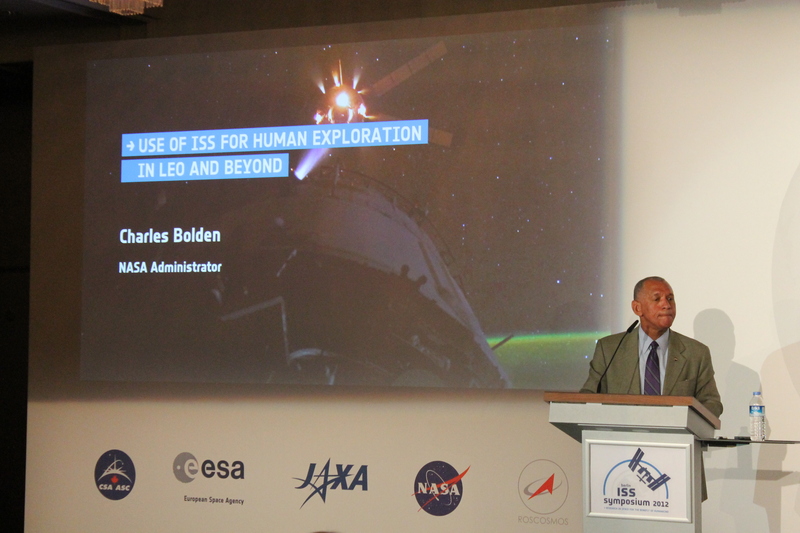 This entry was posted in Notes, Speakers, Station operations, Video and tagged administrator, bolden, charles, nasa. Bookmark the permalink.